The purpose of this Microsoft Word Tips & Microsoft Word Help page is to provide and publish AutoCorrect Utility Manager (ACUM); a simple utility for adding, deleting, redefining Word AutoCorrect entries and to facilitate AutoCorrect entry backup, restore and transfer. I decided to expand the project after an immigration judge friend and fellow VBA enthusiast shared some of his code with me. He had done some interesting things with his code and I wanted to expand on it here. 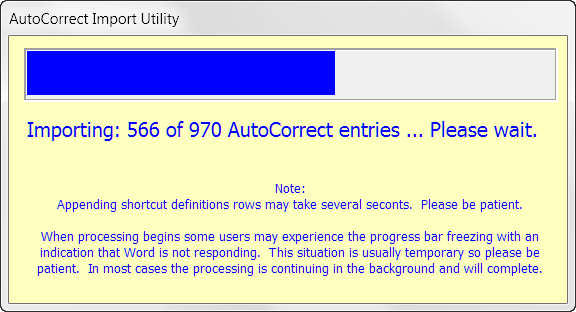 Word ships with over 900 pre-defined AutoCorrect entries. Over time users who are familiar with the AutoCorrect utility create many more custom AutoCorrect entries for their personal use. 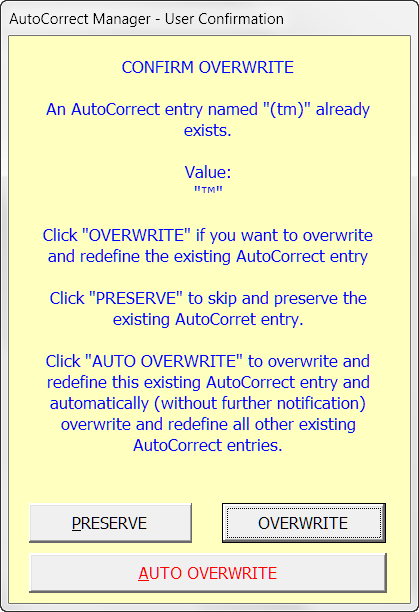 The pre-defined and user defined AutoCorrect entries can be in one of two forms or types. Plain text entries are stored in the user's regional language AutoCorrect List (*.acl) file. For example the *.acl file for U.S. English is MSO1033.acl and is typically located in the user's roaming profile folder. Formatted entries are stored in the user's Normal template. While both the AutoCorrect List file and Normal template can be backed up, they can be difficult to locate especially when protected and operation system files are hidden, and they can become corrupt. Corrupt files are easily repaired, but in so doing, any custom AutoCorrect entries that you create are lost. With ACUM, you can easily create a master list of AutoCorrect entries and restore those entries to your AutoCorrect List and Normal template file when required. The Shortcut Definition Table can provide a complete listing of existing AutoCorrect entries defined in Word, and be used to add, redefine, delete, backup, restore or transfer AutoCorrect entries. Column 1 "Type" contains a dropdown list content control for displaying or selecting the shortcut type, either "Plain Text" or "Formatted." When you add or insert a new SDR using the “Add Plain Text Shortcut” or "Add Formatted Shortcut" commands, the content control automatically displays the correct shortcut type. You can change a shortcut type by changing the selection in the dropdown list. If changed, and if the SDR is previously marked "Processed", the SDR column 4 value is automatically changed to "Create" thereby marking the SDR for processing. Column 2 "Shortcut" defines or displays the unique shortcut to trigger the AutoCorrect entry associated with the SDR. To avoid validation errors, ensure each entry in column 2 is unique. Column 3 "AutoCorrect Value" defines or displays the AutoCorrect replacement plain or rich text. This can contain plain text, formatted text or an object (shapes, images, tables, etc.). Column 4 "Action/Status" indicates the SDR status. SDRs marked "Create" are marked for processing. SDRs marked "Processed" have been imported from Word or have been previously processed using the ACUM. Processed SRDs are bypassed when the “Create/Redefine Entries” command is used. If an SDR is marked "Create" and an existing AutoCorrect entry is detected during processing, the user will be asked whether to skip or redefine the AutoCorrect entry. 1. Do not delete or relocate the Shortcut Definition Table. 2. Delete the sample Shortcut Definition Row prior to first use. Using the "Import from Word" button command you can import all of your plain text and formatted AutoCorrect entries into the SDT. You can then save the file as a backup of your AutoCorrect entries or simply continue and use the imported list as your AutoCorrect Manager Utility file. Note: The Import from Word utility is primarily designed for first use when creating a backup file or after resetting and clearing the SDT. 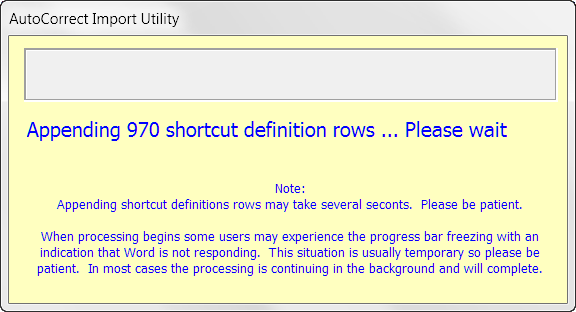 Importing from Word when the SDT contains one or more SDRs increases the likelihood of having validation errors (e.g., duplicate shortcuts) during processing. To add a plain text or formatted SDR and later create a corresponding AutoCorrect entry, click the "Add Plain Text Short" or "Add Formatted Shortcut." 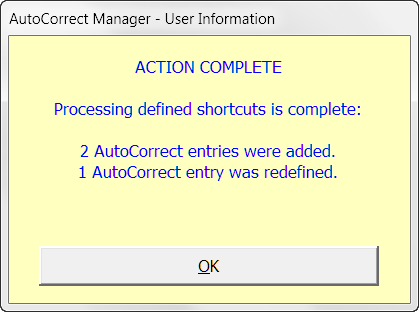 A new SDR is inserted or appended in the SDT and you simply enter the unique shortcut and AutoText replacement. After you have added one or more SDRs, click the ribbon "Create/Redefine Shortcuts" button control. To redefine an existing AutoCorrect entry, find the SDR associated with the entry you want to redefine and change the AutoCorrect replacement value. Then change the status code in column 4 from Processed to Create. After adding or redefining one or more SDRs, click the ribbon "Create/Redefine Shortcuts" button control. To delete one or more SDRs and associated AutoCorrect entries, select one or more SDRs to delete and click the ribbon "Delete Shortcut(s)" button control. To reset the SDT, click the ribbon "Reset Definition Table" button control. Resetting the SDT deletes all SDRs. This action has no affect on the associated AutoCorrect entries and is intended primarily for when you want to import AutoCorrect entries from Word to create a new backup file or baseline SDT. Using the ribbon "Sort by Shortcut" or "Sort by Phrase" button controls, you can sort the SDT by shortcut or defined AutoCorrect value. When SDRs are added the SDR status column is automatically marked "Create." After processing or when imported from Word, SDRs are automatically marked "Processed." Changing an SDR type will automatically reset the Action/Status indicator to "Create" after the user tabs or clicks out of the type content control. When processing the SDT is first validated. Validation ensures that a unique shortcut is defined in column 2 for each SDR, SDRs marked Plain Text do not contain a table or other object in column 3 and that data is provided in the remaining columns. Invalid SDRs are flagged with shading to highlight user actions required. Note: The SDT must be validated before processing can be completed. The ribbon "Mark All for Processing" or "Mark All Processed" button controls can be used to globally replace status markings in the SDT. Note: When restoring or transferring AutoCorrect entries, all the SDRs you want to restore or transfer must be marked with "Create" in the SDR status column. Otherwise the SDR is skipped during processing. After opening the AutoCorrect Utility Manager template file or a file previously saved as a backup, and after making any changes to the SDT, you are ready for processing. To process the SDT, click the ribbon "Create/Redefine Entries" button control. The processor will automatically validate the SDT. If validation passes, processing will automatically begin. Progress bars indicate the status of validation and processing. When processing is complete, a notification message displays. While processing if an AutoCorrect entry is detected with a shortcut trigger that matches the shortcut defined in the SDR the user is alerted and must decide to overwrite and redefine the AutoCorrect entry or skip it. If the SDT does not validate, the invalid SDRs are flagged for user action and a notification is displayed. Note: The ACUM only flags Plain Text type errors and only if a table or other object (e.g., chart, drawing, textbox etc.) is detected in column 3. 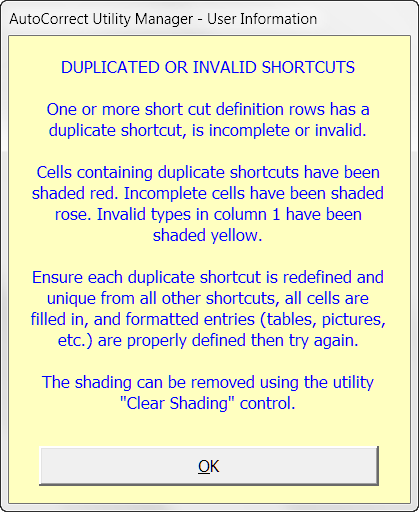 As shown above, duplicate shortcuts will not validate and will prevent further processing. To minimize the likelihood of creating SDRs with a duplicate shortcut, importing from Word should normally only be done after the SDT has been reset (contains only the header row). When importing from Word the ACUM first appends rows to the SDT. This process may take a few seconds depending on your processor speed and number of AutoCorrect entries you have defined. After the necessary number of rows are added and formatted, then the import begins. The process of importing is indicated by progress bars. 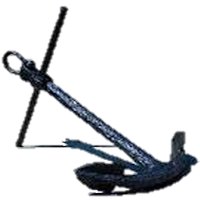 The following is suggested for getting the most usefulness from the ACUM. Use the ACUM template to create ACUM files just like you would use any Word template. Periodically create a document with the ACUM template, Import from Word, and then save the document as a complete AutoCorrect entry backup file. Restore your AutoCorrect entries using the backup file if your ACL file or Normal template is inadvertently deleted or becomes corrupt. Use the saved backup file to transfer AutoCorrect entries to a new or second computer. For example if you create several AutoCorrect entries on your work PC, create a new backup file and bring it home to update your home PC. Create a document with the ACUM template and use it to create and record only your custom AutoCorrect entries. Processing with a short list like this will run much faster than processing a list after importing from Word. Use the short list to keep your custom AutoCorrect entries synchronized be your home and work PCs. 1. This tips page, illustrations and examples were developed using Word 2010. The ACUM template is fully functional with Word 2007/2010/2013. Special thanks to Word MVP Jay Freedman for his technical review and evaluation of this project. That's it! I hope you enjoy using AutoCorrect Utility Manager. You can download the template here: AutoCorrect Utility Manager.